Mobile office suite Polaris Office now offers a cloud option for storing your documents. But in all the metrics that matter—price, privacy, and functionality—you’d be better served by passing it by. 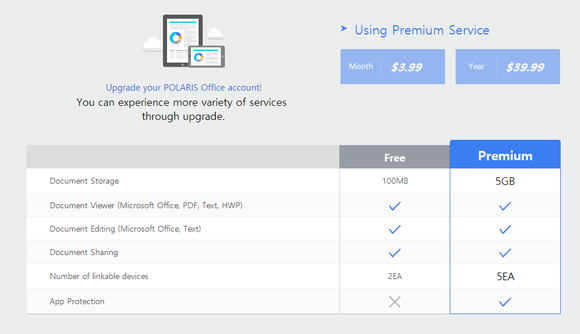 The new version of Polaris Office works on a freemium model: The basic cloud service is free, but users also have the option of paying $3.99 per month ($39.99 annually) for premium services, including the option to store up to 5GB worth of files online. Like a number of other office suites that compete with Microsoft Office, Polaris works across iOS and Android, allowing users to create, open, and edit Excel, PowerPoint, and Word documents, as well as text documents. The app is free on Android, but costs $12.99 as an iOS app. Polaris Office also runs on PCs as either a Web or downloadable app. (Mac support is due soon, the company says.) And that’s where the weirdness begins. On Android, Polaris Office is a perfectly functional experience. On a phone or tablet, Polaris Office is rather pleasant to use. Users have the option of connecting multiple cloud storage services, including Dropbox, Microsoft’s OneDrive, and Google Drive. 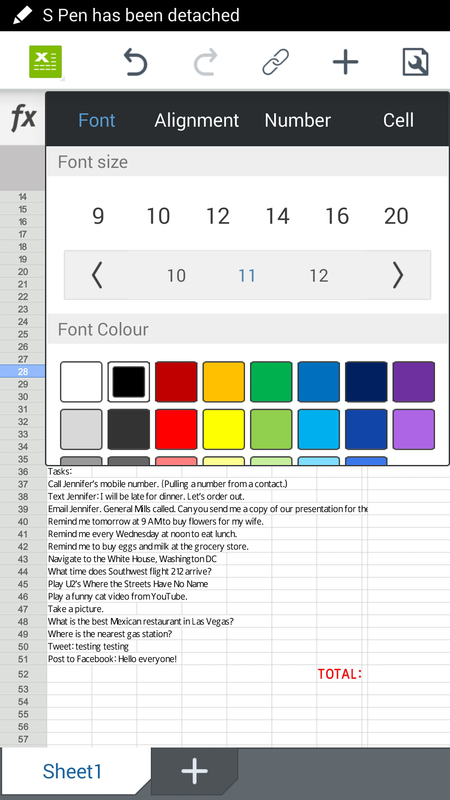 App menus are well organized, and while there’s a bit of a learning curve in discovering which menu options are hidden where, Polaris Office is perfectly acceptable for basic editing and document creation. While Microsoft’s Office for iPad surpasses it both aesthetically and functionally, Polaris Office’s mobile environment is at least competent. On the Web, however, you can’t do much. And on the PC, Polaris is even more unfriendly: If there’s a way to edit or create a document, I can’t find it. 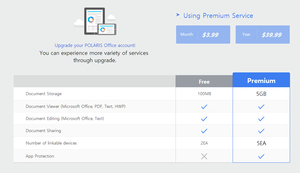 Instead, Polaris only offers PC users the option of viewing the document. You can also download the document from the Polaris Cloud to your desktop and open it in Microsoft Office, but that sort of defeats the purpose. On the other hand, the PC version—and only the PC version, at least for now—opens up a right-hand window allowing you to either write memos to yourself, apparently a version of “track changes.” A complementary “sharing panel” allows you to exchange those ideas with friends and colleagues. However, this notion of sharing and collaboration has been done elsewhere and with better implementation. Polaris uses a “freemium” model. If you do decide to store your documents within the Polaris cloud, you can increase your storage allotment by inviting friends (100MB per person) or downloading the desktop app. You’ll probably want to give the latest version of Polaris Office a pass. The app simply lacks basic functionality for the PC at this point. And the chance that Infraware will spam your friends and business contacts with promotions and other ads should give a more serious user pause.